Oh Snap! The Friggin Amazing J.Ho Sketchblog...: The Savage Sword of... ? The Savage Sword of... ? After many weeks devoid of He-Man and the Masters of the Universe, I present to you a drawing of the rare and mysterious action figure known colloquially among fans as "Savage He-Man." The figure is also known by the far less glamorous moniker, "Wonder Bread He-Man" by virtue of having been a mail-in offer from the eponymous, um... bread. The fact that this figure was available through an offer from Wonder Bread is about all people can agree on. The concrete details of how, when, or why, are apparently forever lost to the forgotten mists of the early 80's. My version of "Savage He-Man" has been re-purposed into a new character, just as I did with Starburst She-Ra several months ago. The visual details of Savage are largely the same. The contrast between the color of his hair and the color of his furry underpants is greater than in the toy, but I think it helps break up the monotony. I chose to interpret the toy's ruddy brown weapons as blood-stained tools of destruction. The blood stains were accomplished by choosing a "spatter" shaped brush in Photoshop and messing around with the shape dynamics and scatter settings. It doesn't completely blend with my style of rendering, but I'm happy with how it turned out because I basically accomplished what I was trying to do. Actually, I had a few options on how to render the weapons, and it was friend Annie (who was hanging out whilst I was coloring this) who challenged me to do it this way. If not for her I would have tried to take the easy way out. She also suggested that his eyes be hazel, and they are. 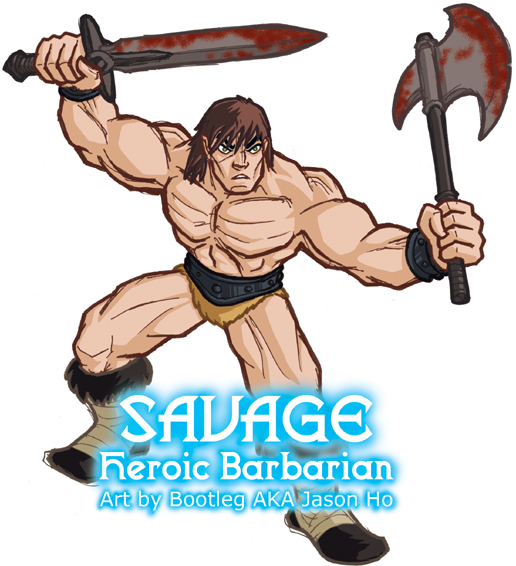 Oh, by the way, the title of this post, and Savage's "Heroic Barbarian" tag, are both references to Conan the Barbarian--according to rumor, Masters of the Universe was originally intended to be a Conan toyline, but was repurposed into an "original" franchise, for whatever reason. Fans speculate that the "Savage He-Man" toys may have been discarded "Conan" figures that were produced before Conan "became" He-Man. But, what's this you say, dear reader? It has been far too long since I posted a painstakingly written bio of a fan character? Read on! HISTORY: The disappearance of He-Man and the Horde invasion of Eternia have left the planet in dire need of heroes. Teela, now developing her latent spellcasting abilities under the tutelage of the Sorceress, found herself isolated and outnumbered by Horde troops. In desperation, and lacking control over her newly emerging abilities, she attempted to summon He-Man by magical means. A mis-wording of her incantation resulted in summoning not He-Man himself, but one 'as good as' or 'as noble as' He-Man. Thus emerged the hulking barbarian Savage--with his sheer power to compliment Teela's skill, the Horde Troops were easily dispatched. Though Savage was displeased at being summoned without any choice in the matter, he was taken by Teela's beauty and fought alongside the forces of Eternos (the Eternian capital) for a time. Coming to terms with the fact that Teela was still infatuated with this so-called He-Man whom he had never met, Savage travelled back to his distant jungle home. Savage remains an ally of Eternos, and is leading his people in fortifying their territories against the inevitable spread of the Horde army. By Crom! How dare you divert my attentions from Conan to He-Man! I am no mark, sir, and will not take this lightly! I will not settle until I have crushed you, drive you before me and hear the lamentations of your women! Ok, on a serious note: I'm not overly keen on this drawing. It's got some good points like color and the fact it looks dead-on for a toy design (something that could be interpreted into molds and sculpted). Still, he looks quite squat, almost like a dwarf (or a Squat... remember those? Old skool WH40K sucka!) and proportions uneasily off. The blood stains, while I understood them to be blood stains, look more like rust. I think in part it is due to the orange-y/iron-y color rather than the pure liquid crimson so beautiful against polished steel. Also, the blood has soft edges. While splatter may result in soft edges in real life, here it again lends itself to the growth of rust. This man needs to see a blacksmith but quick! I want to see more Conan-y S&S things plz. this dude better not get any blood on his furry underpants. furry underpants are a b*tch to clean. ps, as a girl i would have liked to get a better look at his barbaric uggs. wh3r3 c4n 1 g3t sum fury und13p4ntz?